The history of science, and specifically mathematics, is a vast topic and one which can never be completely studied as much of the work of ancient times remains undiscovered or has been lost through time. Nevertheless there is much that is known and many important discoveries have been made, especially over the last 150 years, which have significantly altered the chronology of the history of mathematics, and the conceptions that had been commonly held prior to that. By the turn of the 21st century it was fair to say that there was definite knowledge of where and when a vast majority of the significant developments of mathematics occurred. However, despite widely available, reliable information, I became aware during the course of more general studies of the history of mathematics, that many discrepancies persist. 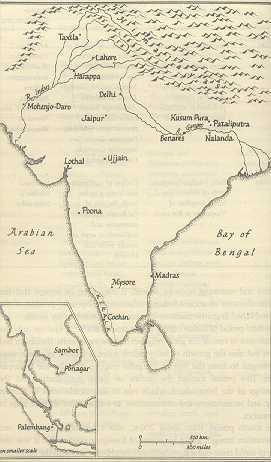 I became drawn to the topic of Indian mathematics, as there appeared to be a distinct and inequitable neglect of the contributions of the sub-continent. Thus, during the course of this project I aim to discuss that despite slowly changing attitudes there is still an ideology' which plagues much of the recorded history of the subject. That is, to some extent very little has changed even in our seemingly enlightened historical and cultural position, and, in specific reference to my study area, many of the developments of Indian mathematics remain almost completely ignored, or worse, attributed to scholars of other nationalities, often European. Thus despite the many discoveries that have been made there has been a great reluctance to acknowledge the contributions of non-European countries. For several hundred years following the European mathematical renaissance of the late 15th and early 16th century there was a commonly held opinion among commentators and historians that mathematics originated in its entirety from Europe and European scholars. The basic chronology of the history of mathematics was very simple; it had primarily been the invention of the ancient Greeks, whose work had continued up to the middle of the first millenium A.D. Following which there was a period of almost 1000 years where no work of significance was carried out until the European renaissance, which coincided with the 'reawakening' of learning and culture in Europe following the so called dark ages. Figure 2.1: Eurocentric chronology of mathematics history. Some historians made some concessions, by acknowledging the work of Egyptian, Babylonian, Indian and Arabic mathematicians (and occasionally the work of the Far East and China). Modified versions of the Eurocentric model commonly took the form seen below. Figure 2.2: Modified Eurocentric model. It is this underhand and in some cases completely fallacious attitude towards Indian mathematics that I have chosen to focus upon. As said this is a vast topic area and although all non-European 'roots' of mathematics have suffered neglect and miss-representation by many historians I am not going to attempt to focus on all non-European roots of mathematical development. I have chosen to focus on the mathematical developments of the Indian sub-continent, as I consider them not only to be severely neglected in histories of mathematics, but also to have produced some of the most remarkable results of mathematics. Indeed, the research I have conducted has highlighted that many Indian mathematical results, beyond being simply remarkable because of the time in which they were derived, show that several 'key' mathematical topics, and subsequent results, indubitably originate from the Indian subcontinent. Having made these discoveries it seems to me an incredible injustice that the work of Indian scholars is not rewarded with a much more prominent place in the history of mathematics. Not only have many historians identified Greek influences in all of the work of Indian scholars, (in some cases by suggesting severely inaccurate dates for the works), several others have even attempted to show Arabic influences, which is quite incredible as several Indian works in fact had a significant influence on early Arab works. Although I by no means wish to talk down the incredible developments of Arab scholars, I believe the developments of Indian scholars are on a par with, and occasionally surpass them. Indian scholars made vast contributions to the field of mathematical astronomy and as a result contributed mightily to the developments of arithmetic, algebra, trigonometry and secondarily geometry (although this topic was well developed by the Greeks) and combinatorics. Perhaps most remarkable were developments in the fields of infinite series expansions of trigonometric expressions and differential calculus. Surpassing all these achievements however was the development of decimal numeration and the place value system, which without doubt stand together as the most remarkable developments in the history of mathematics, and possibly one of the foremost developments in the history of humankind. The decimal place value system allowed the subject of mathematics to be developed in ways that simply would not have been possible otherwise. It also allowed numbers to be used more extensively and by vastly more people than ever before. The aim of my work is not just to paint as accurate a picture of the developments of mathematics by the Indian peoples as possible, but also to attempt to give reasons as to why Europe has chosen to neglect the facts of history. Through a detailed discussion of the mathematics of the Indian subcontinent I hope to highlight why this 'neglect' is such an injustice, and briefly discuss the possible consequences of this neglect. Figure 2.3: Non-European mathematics during the dark ages. While this is unavoidable it is vital to appreciate the uniqueness and ingenuity of the developments of Indian scholars, even if the results are common-place now. We also view mathematics from an intrinsically European standpoint due largely to the influence of European scholars over the last 500 years and the colonisation of much of the world by European countries. Perhaps this is why many historians find it hard to accept that many results and developments of mathematics are not European in origin. In short, if we are European, somewhat unavoidably we view history from our indigenous standpoint. There is also a slight methodological problem related to the 'labeling' of the topic of "Indian mathematics" that I will briefly discuss. Using the label "Indian mathematics" is not entirely accurate as much of the earliest "Indian mathematics" was developed in areas, which are now part of Pakistan. The label is used for simplicity and can be justified by stating that developments took place in the Indian subcontinent. Quite often the 'label' Hindu mathematics is used, but it is less accurate as many of the scholars were not Hindus. Finally before progressing I will specify the time period that my work will cover. The earliest origins of Indian mathematics have been dated to around 3000 BC and this seems a sensible point at which to commence my discussion, while work of a significant nature was still being carried out in the south of India in the 16th century, following which there was an eventual decline. It is hence a vast time scale of almost 5000 years, and indeed it may be greater than that, the estimation of 3000 BC is a slightly crude approximation, and there remains much controversy with regards to the dating of many works prior to 400 AD. It is also worth pointing out that this lack of certainty has allowed several unscrupulous scholars to pick dates of choice for certain Indian discoveries so as to justify suggestions for Greek, Arab or other influences. In situations where this has arisen I will attempt to the best of my ability to state fact, although in some cases a well-informed guess will have to suffice. I will now commence with the main body of my work, a discussion of the development of mathematics, as a subject, in India, through which I hope to highlight (as previously stated) both the many remarkable discoveries, and results, and where neglect or incorrect analysis has occurred.